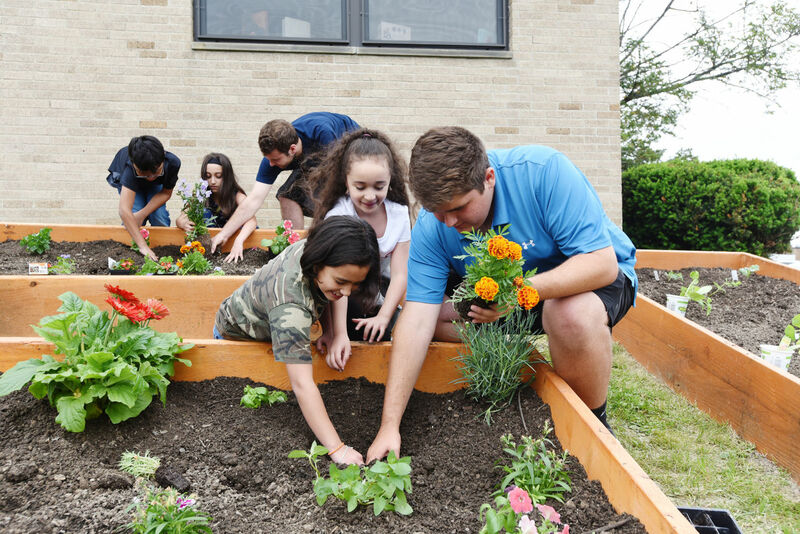 Mount Saint Mary College student Charles Benfer of Milton, N.Y. (center) worked with Bishop Dunn Memorial School to create fun math problems centered on the schoolâ€™s Sensory Garden. Photo by Lee Ferris. NEWBURGH – For about 20 Mount Saint Mary College scholars, happiness is a stunning view of the Hudson River, a warm breeze, and the opportunity to conduct their own diverse research projects through the college’s annual Summer Undergraduate Research Experience (SURE). Mount professors from across disciplines acted as mentors to the students as they explored a plethora of subjects. The effort was coordinated by Evan Merkhofer, assistant professor of Biology. In the Natural Sciences, faculty mentor James Moran, associate professor of Biology, oversaw Kassidy Hallum of Lake Grove. N.Y. and Elizabeth Halpin of LaGrangeville, N.Y. on their project, “Development of an Antibody-Based Detection Method for OxyVita Blood Substitute.” When perfected, the OxyVita blood substitute could decrease the need for blood donations. Since it does not require refrigeration, it could be used in hospitals, combat situations, during power outages, and more. In previous years of the SURE program, Daven and Lee Fothergill, a fellow Mount Mathematics professor, laid the groundwork for the Hudson Valley Math Trails, which mixes Math with art, history, and more. This year, Daven and his students added the Sensory Garden to the project. The Sensory Garden is an outdoor learning space intended for use by students in Pre-K through college, noted Nancy Benfer ’03 MSEd ’14, Bishop Dunn principal and Mount adjunct professor. The garden is a great place to design and implement mathematical challenges for young minds, student Charles Benfer noted. As SURE 2018 drew to a close, Dr. Jason N. Adsit, president of Mount Saint Mary College, congratulated the students on a job well done. Dr. Adsit, the college’s seventh full-time president, began his tenure on June 1, 2018. He joins the Mount family from D’Youville College in Buffalo, N.Y., where he served as Dean of the School of Arts, Sciences, and Education, as well as Director of the Educational Leadership Doctoral Program. Other SURE projects included “The Development of Easier Parkinson’s Disease Terminology to Improve Family and Patient Education,” by student Kathleen Abbott of Oakville, Conn. and faculty mentor Anne-Marie Uebbing, associate professor of Nursing; a plant and animal survey of the Hoyt Foundation forest in Walden, N.Y. by student Raymond Shepherd of Red Hook, N.Y. and faculty mentor Douglas Robinson, associate professor of Biology; and “Development of Edible Vaccines for Candida Albicans, the Causative agent of Candidiasis” by students Allison Dionne of Burlington, Conn., Thomas Hofbauer of Woodcliff Lake, N.J., and Sarah Waleck of Glenwood, N.J., and faculty mentor Evan Merkhofer, assistant professor of Biology.